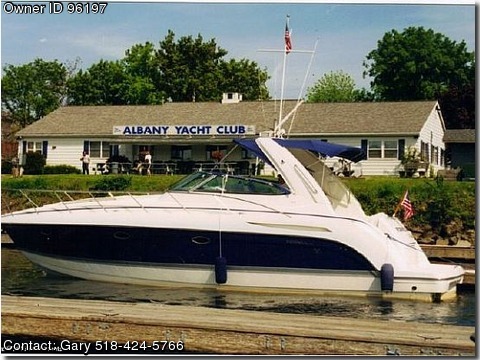 Please contact the owner Gary @ 518-424-5766 or toothii(at)aol(dot)com. STEP UP TO THE QUALITY AND THE PRIDE OF OWNERSHIP OF A FORMULA PERFORMANCE CRUISER! Formula boats are in a class by themselves and this 2002 Formula 37PC is no exception! She is in beautiful condition and has been used in freshwater only! This boat is ready for many days and nights of luxurious cruising with family and friends! US Coast Guard Documentation WINTER STORAGE ALREADY PAID BY OWNER! Boat will go into winter storage October 11th Features: Twin Mercruiser 8.1 L 430 HP High Output Motors w/ 170 hours Bennett Automatic Trim Leveling System ZF Electronic Trans Bow Thruster w/ Joystick Twin Counter Rotating Nibral 24" Bronze 4-Blade Props Full Gauges Northstar GPS/Chartplotter w/ 2- cards, Symron Autopilot VHF Radio w/ Antenna Kenwood AM/FM/10 Disc CD W/ 150 watt Amplifier Electric Windlass (all chain) with Bow and Cockpit Controls Halon Auto Fire suppression system . Kohler 7.3 kw Generator w/less than 60 hours 16,000 BTU Air Conditioning w/ Heat Dark Cherry Cabinets Custom Formula Linens: Bedspread Pillows,Etc Full canvas plus Mooring Cover (used 3 times) Twin Sunpads forward Stowable Stern Pad, Cockpit rugs, Cockpit wetbar w/ Icemaker Vacu-Flush Head Full Galley w/ 2- Burner Electric Stove Norcold refrigerator,Microwave Forward Queensize Berth AFT Cabin Seating w/ Full Size Bed Conversion Quality Leatherett Seatee Couch Converts to Twin Berth Central Vac 2-TVs 1-DVD Plater And much more!